Is this a coin flip? I spent the weekend writing a couple of articles covering my trip to the UK, and in them I made the observation that UK chess is a lot more solid and positional than Australian chess. While in the UK I also made this observation, remarking that a lot of games sin Australia start with players just throwing pieces out there, and then looking for whatever tactics may arise. There are of course exceptions in both directions, as I saw at the 4NCL weekender. In the game below I'm not convinced either side was looking for a positional edge, especially after 8.d5 set fire to the position. White then decided to throw more wood onto the fire with 11.Nxg6 with the idea of keeping the kin in the centre. But it wasn't until Black passed on 15. 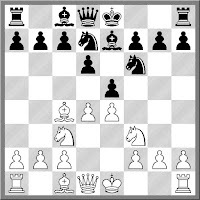 ... Nd3+ that White could begin to breath easier, and a few move later it was a full on king hunt, ending in Black getting mated. While listening to Australia spin its way to victory in the 1st Test Match against India, I heard on of the commentators say "Smith is like a chess grandmaster, moving the pieces around the board". It was of course one of the Indian commentators, who said this, while the Australia commentator did not seem to react. I suspect for an Indian sports fan, or commentator, such a comment was perfectly sensible and understandable, tapping into the cultural awareness of chess in that country. For Australian fans, the comment might be a little bit more confusing or odd, although even then I think that most Australian fans would at least recognise the terms. Anyway, I thought it was a nice intrusion into the normally dry cricket commentary (at least in Australia), and I hope to hear more of it over the next couple of tests. Flicking through the games from the FIDE GP in Sharjah, I was surprised by the number of draws. I know at the top level it is pretty easy to make a draw if you want to, especially with White, but I had expected the change in format to an 18 player swiss (rather than a round robin) would have at least encouraged more decisive games. As it stands around 75% of the games have been drawn, although this number seems to be coming down. A few people have asked me about the dress code that was put in place for the 2017 Womens World Championship being held in Iran. Instead of debating whether it is appropriate, or whether the event hosts have the right to set such conditions, I simply point out that despite playing chess in a number of countries, I have never been told what I must wear at the board (although I have been asked to wear a suit on occasion while working as an arbiter). I'm not saying that those who played or chose not to were right/wrong, just that this rule seems to be only applied to 50% of the worlds population. I've also never been asked not to play an opponent for political reasons. The issue of refusing to play against players from a certain country has come up again, with news that Iranian player Borna Derakhshani has been suspended by his federation for playing against Alex Huzman from Israel at the Gibraltar Masters. This has been an issue at other events, including the Chess Olympiad, although my suggestion that such boycotts are only legally acceptable if supported by a directive from the players country hasn't gained much traction within FIDE. Instead FIDE publicly pretend they have no policy on this matter, although privately they do (eg at Olympiads). However I do find this case slightly surprising, as there was at least one instance in the tournament where and Iranian v Israeli pairing was changed. So I'm not sure why this one went through. A long time ago I was an avid watcher of The Simpsons. But as I got older I kind of lost interest, mainly due to the fact that most 'new' episodes recycled ideas and characters from previous episodes. So eventually I moved on the Futurama, Family Guy, and more recently Rick & Morty, and Archer. (PS Bring back Duckman). However there is still a little life left in the Simpsons, at least for chess fans. World Champion Magnus Carlsen appeared in the latest episode (shown in the US), and it wasn't just a drive by. The whole episode revolved around Homer's previous chess career(! ), with Carlsen encouraging Homer to continue playing. At least one review I read not only said Carlsen's performance was good (and self deprecating), but the writers seem to get the chess stuff right (including some pretty accurate name drops). I'm not sure what the lag is between US showings and Australia but hopefully I'll be alert enough to catch it when it turns up. In the end I decided I wasn't going to gamble on my opponent forgetting his own analysis from a few years back, and so decided to play it safe with 6.O-O, which was recommended by theory. It turned out to be at least 50% correct, as the game eventually ended in a draw. During some downtime at Hastings, a question was asked about methods of choosing a move. The question was "If you cannot decide between two moves, are you allowed to toss a coin to make a choice?" The question was asked of a number of very experienced international arbiters (and myself), and we all pretty much said it would not be allowed as you were relying on external assistance. But being experienced arbiters we also suggested alternative methods of making such choices, including using the second hand on your watch to simulate a coin toss. A couple of weeks later I found myself mentally tossing such a coin at the Gibraltar Masters. I knew my opponent played a specific line against 1.e4 and was pretty sure I was going to reach the diagrammed position. The choice was either to castle, or sacrifice on f7. Having looked at it further it turns out that the sacrifice is not quite sound, but there was still a wrinkle. On two occasions previous opponents had sacrificed on f7 with a 1-1 result. The odd thing was that where he chose the correct line, he eventually lost, but when he chose the losing line, he actually won. So the sacrifice may have worked, if for the wrong reasons. While I was overseas I kept up with events outside the chess world, including the Human v AI Poker Match. The Libratus Poker bot, developed at Carnegie-Mellon played 4 poker pros in heads up no limit holdem, and beat all 4 of them. As with most AI v Human matches, this was a rematch after an earlier version of the program lost to human players a few years back. Reading about the match, and the approach the bot used, there was one significant factor which I recognised from earlier Chess/Checkers/Go matches. While there was plenty of smarts built into each of these engines, it was the lack of emotional attachment to decisions that seems to be a big difference. Humans may decide that a certain move or choice is the 'smart play', but then decide not to play it due to other factors (tiredness, intuition, emotion). Bot's on the other hand will make a decision and then execute it. In chess this is often manifested by a change of plan depending on the previous move, which humans are slower to try. According to the authors of Libratus, in certain situations Libratus was 'fearless', which gave it an advantage. While the win for the bot is significant I'll withhold judgement on whether it will change poker in the same way that engines changed chess. There may be a reassessment of how certain hands should be played, but overall I think the 'game space' is small enough that humans already have most of it covered. The ACT Chess Championship is taking place over the weekend of the 10th,11th,12th and 13th of March (Canberra Day Long Weekend). It will be a 7 round FIDE rated swiss with a time limit of 90m+30s. There will be one round on Friday evening (10th) and then 2 rounds for each of the other days. The tournament is open to all residents of the ACT and surrounding regions. Entry fee is $65 ($45 for concessions). Players must be a member of the ACT Chess Association to play. This event has been quite strong over the last few years with IM Junta Ikeda and IM Andrew Brown regularly taking part. There are a number of improving players closing the gap between the IM's and the rest of the field, so it might be quite competitive this year. You can find the flyer for the event at http://vesus.org/tournaments/2017-act-championship/ Entries will be accepted on the day (no late fee), but you can also email Cam Cunningham (ACTCA President) if you wish to pre enter. Contact details are on the flyer. While Wilhelm Steinitz is well known as the "Father of Positional Chess", he started his career as a bit of a care free hacker. Adolf Anderssen christened him the "Austrian Morphy" and his style was described as "brilliant but not safe". This all changed towards the end of the 1860's when he began to formulate his theories on positional play, changing his style to "safe but not brilliant". While this style began to bring him success at the top level, he still had an eye for a sharp combination. Against the top players he may have been solid, but weaker players still gave him chances to show his brilliance. One such game occurred during his tour of Great Britain in 1873. As it was a simul the quality of the opposition was probably not that great, but nonetheless the finishing position is one of the nicer ones I have seen. The next round of the UK 4NCL competition is currently being played, and having played the last weekend, I'd thought I'd look in. Both White Rose teams have bounced back it seems, with the top team winning 7.5-0.5 against the Barbican 2 team, while in the 2nd division scored a narrow 4.5-3.5 win over the KJCA Kings. The Division 1 team is now lying second in its division and looks good to qualify for the next stage of the competition. The win for the 2nd's was its first for the season, but is probably too late for the team to catch the leaders. It is interesting to observe the difference in strength between the various teams, with powerhouses like Guildford able to wheel out GM's as required. Last month Gawain Jones was busy winning the Wijk aan Zee B event, but this month returned to Board 2 for Guildford. On the other hand many teams have a few titled players, bolstered by highly rated local players. While some thinks this disparity detracts from the competitiveness, it is probably no different from the EPL (ignoring Leicester last season), and adds a distinctive character to the competition. As flagged yesterday, today involved a trip to the Lifeline Bookfair in Canberra. In some years there are very slim pickings but this year wasn't bad. I was able to grab about 6 decent books, while a couple of other collectors picked up a similar amount. There were a number of 'historical' books, including Botvinnik's book on the 1941 Absolute Championship of the USSR, and the tournament book from the 1972 San Antonio Tournament (Karpov's first big overseas success). And I also located a copy of The Batsford Guide to Chess Openings by Barden and Harding, which was the first real opening book I owned. My original copy (which was autographed by young IM's Rogers and Johansen in 1983) disappeared a number of years back, so it was good to finally track down a replacement. Flipping through the San Antonio book I saw the late Ken Smith was one of the participants. He was well known for his advocacy of the Morra Gambit (or Smith-Morra as he called it), and he played it whenever he could. However his results with it were poor, leading Larsen to annotate "1.e4 e6(?) Stronger is 1. ... c5, which wins a pawn (Smith always plays the Morra Gambit, in this tournament with disastrous results)". Probably the best (or worst) example of this, was his game against Mecking late in the tournament. Having sat at the bottom of the tournament throughout, he decided to throw everything into the attack, but just ended up resigning. I had to curtail my usual over expenditure on books while travelling, as the excess weight charges on my luggage may have killed me. However there a no such restrictions on what I can take on the bus, which is good news, as the Canberra Lifeline Bookfair is on tomorrow. While I did not deliberately time my return from overseas to make sure I could attend, it is indeed fortuitous scheduling. So I'll be up early in the morning, hopefully to snap up whatever chess books are on offer. If not, the fall back is always IT and maths, and failing that, whatever randomness peaks my interest. After 2 moths away, Harry and I are finally back in Australia (although our luggage may not be). We seem to have missed the absolute worst of the summer, although it is forecast to be 38 degrees in Canberra, just in time for my return to Street Chess. The trip back was quite good, aided by some good luck. For the Abu Dhabi leg, Harry and I ended up being upgraded to Business Class, which was a practice that I had assumed was almost extinct (as airlines often offer business class upgrades on an auction basis). This made what is normally the toughest part of the trip quite pleasant, as we were able to sleep for a lot of the trip. Now that I'm back there is a lot of catching up to do. A couple of big events are coming up in the near future (ACT Championships, Dubbo and O2C Doeberl Cup), as well as some other chess activities (ACCQ, ACTJCL). And of course now the holiday is over, work starts again on Monday. But for now, some sleep, some writing and a lot of recovering. Today is my last day in the UK. Flying out of London this evening, and will be back in Australia in around 40 hours. Its been an interesting two months away, with a lot of chess, a lot of travelling, and a lot of full English breakfast's. I made a number of new friends, while catching up with a lot of old ones. Of course regular readers of this blog have had an idea of how the last two months went (from a chess point of view). I did get to a number of events I've always wanted to attend, and while my results weren't great, I did enjoy being there. Speaking of results I think I ended up with 4 wins, 10 draws and 8 losses in my long time control games. I dropped around 60 rating points as a result, which I've decided to blame on turning 50! I did a little better at blitz, scoring 4/5 in the one tournament I played in to come 2nd. I also directed (or helped direct) a few events. Being an assistant arbiter at Hastings was a highlight, while being part of the team at the LCC Rapid (450 players) was informative. I also picked up a different perspective on how events can be organised, and may try and bring some ideas back to Australia. Overall it was a worthwhile trip and one I can recommend to other players. Based on the results of my son Harry, for young Australian players, try it before you turn 18 (to pick up the 40 k factor for your rating), while for older players, remember, it is still a holiday. One tradition that still continues in some the UK events I visited or played at was the awarding of a "Best Game" prize. This was done at Hastings, and was also done at Gibraltar. In Australia it used to happen on occasion, but fell by the wayside as there were often not enough nominations, and not enough qualified judges. In such a big event as Gibraltar I'm not sure how they found the time to check all the games, as there were a number of brilliant games played. Having on site commentators probably helped, as Simon Williams and Jovanka Houska featured the best games from each round, often bringing the winner in for an interview. Even then I saw 2 or 3 games a round that could easily have won such a prize in a smaller event, so making a final decision seemed difficult. In the end the winner was Veselin Topalov's win over Bogdan-Daniel Deac (if I heard the announcement correctly that is). At the time I first saw it it looked spectacular, and the judge(s) obviously agreed. Topalov allowed Deac to get a black pawn all the way to c2 (forking rooks) but it was all to late as Toplaov had calculated a massive win of material due to the threat of mate on the bank rank. And all in 25 moves. With that out of the way, interest turned to who would survive the final round. GM Michael Adams (ENG) drew with GM David Anton (ESP) to leave Anton on 8/10. Wins by Nakamura and Yangyi Yu also left them on 8, while Gelfand, Vachier Lagrave and Cheperinov fell short after drawing their games. This meant there was to be a playoff, with Yi and Nakamura playing first with the winner then playing Anton (who had the best tie-break). Nakamura and Yi drew the first 2 rapid games, before Nakamura won the blitz tie break 2-0. Then in the final Nakamura and Anton drew the first rapid games, before Nakamura claimed first prize by winning the second. This is Nakamura's 4th win of this event, including wins last year and this. The tournament concluded with a well attended prize giving dinner, and lots of supportive speeches from the tournament sponsors, and the Gibraltar government. So for those thinking about playing this wonderful event, it will be on next year, but if you want to play in the Masters, you need to get your entry in early. All the way through the tournament I've kind of thought that GM David Anton Guijarro (ESP) was a bit of a 'surprise packet', whose time at the top was soon to end. But with 1 round left to play, Anton Guijarro is actually the outright leader of the tournament. Today he dispatched Veselin Topalov (BUL) while his closes rivals drew. He is up against Michael Adams tomorrow, and a draw is at least a guaranteed share of first place. His current TPR is 2878 and is picking up a bag load of rating points. Hoping that Adams gets something from the game is the group of players on 7/9. With 8/10 being the minimum winning score (it could be 8.5), Gelfand, Vachier-Lagrave, Nakamura, Romain, Yu, Ju and Cheparinov are hoping both to win and for Anton Guijarro not to. There were a couple of disappointed Australian players in this round, with IM Bobby Cheng losing to GM Andrei Istratescu and FM Zachary Loh drawing with Peter Korning. Cheng's loss puts paid to his chances of a GM norm, while even Loh's opponent thought that the fact he escaped proves there is 'no justice' in chess. I scored my second win of the tournament after my opponent gave me too many good squares for my pieces. This puts me on 3.5/9 which was my target score at the start of my trip. While the game wasn't perfect, it was at least an improvement on my previous couple of rounds. Tomorrow sees an early start for the last round 11am local time, 9pm Canberra time. If you haven't been able to watch any of the tournament coverage up until now, take advantage of this to catch the online commentary. It is well worth it. Normally the leading pack in chess events gets smaller after each round, but round 8 of the Gibraltar Masters saw it increase by one. All 4 of the overnight leaders drew with each other, and so were joined by Veselin Topalov, who beat Emil Sutovsky to reach 6.5. There were also quite a lot of other drawn games today. so the next group down also seemed to get bigger. The all England pairing of Adams and Short was short (and drawn), as was the Cheparinov Stefanova pairing, but the all Chinese pairing of Ju and Hou ended in a win for Ju. Fabiano Caruna also played himself back into contention with a win over GN Gopal, whole IM Bobby Cheng kept his GM norm chances afloat with a win over WGM Petra Papp. A win over GM Istratescu in round 9 will probably do it, or a draw followed by a round 10 win (depending on his opponent). Down at the far end of the field, I'm stumbling towards the finish line with a mixtures of draws and losses. Yesterdays game was one of those late tournament efforts where I saw very little and lost miserably, while today I chose the wrong plan and had to really dig in to save half a point. While I'm still looking for 3/3.5 points (which was my target score), I may do it an a fairly ugly manner.